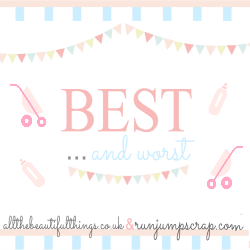 Thank you to the lovely Sarah over at Run, Jump, Scrap for nominating me for the ‘I’m the Mum who…’ tag. Pop over to see her post here and have a read of the rest of her blog, it’s fab! I love reading and writing posts like this as they delve a little deeper into our personalities. So let’s get started. Loves planning out my little boys outfits & treats it slightly like a dressing up game. Worries I am not doing enough in a day to give Little Man an exciting childhood. Constantly tells people that Little Man is tall for his age (he often got funny looks for being in a pushchair or on reins). Is fed up with watching Disney’s Planes over and over again. Tells Little Man that an annoying toy has gone to work with Daddy. Will never take the love I have for Little Man for granted. I nominate Picking Up Toys & Mumma Scribbles if you ladies fancy playing. “Tells Sam that an annoying toy has gone to work with Daddy.” Ha! that’s a good one! !